On Sunday, April 14, starting at 2pm, several Quebec faith and civil society organizations are holding a large rally at Place Émilie-Gamelin, 1500, rue Berri, H2L 2C4. Politicians from the different levels of government have also confirmed their presence. Enjoy some hidden gems that may surprise you! Forty years ago, my predecessor Dean Shepherd initiated a Christian commemoration of the Shoah in Montreal. This event took place on 22 April 1979, was repeated at the Cathedral the following year, and has been taking place in different churches around Montreal ever since. This year, for the 40th anniversary of this initial commemoration, this service – organized by the Christian-Jewish dialogue of Montréal - returns to Christ Church Cathedral. 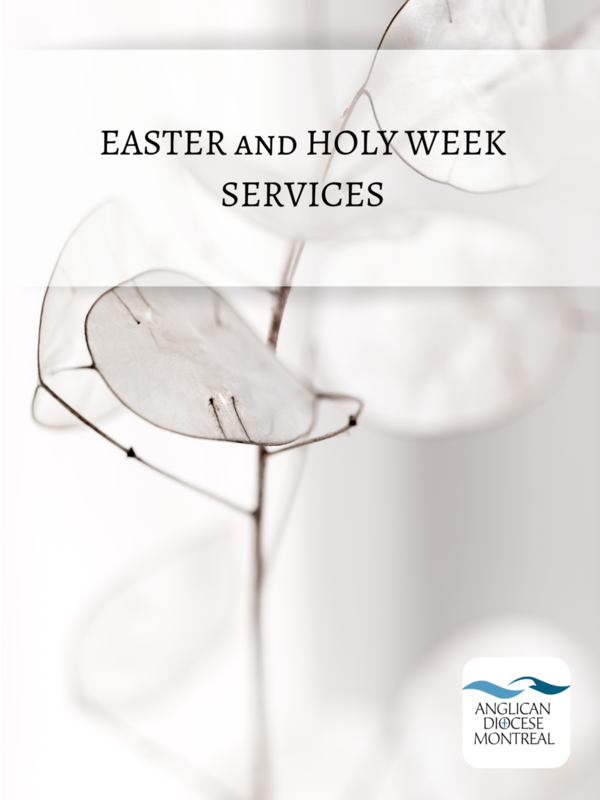 I am therefore writing to invite you and members of your congregations to join us for this service which will take place on 5 May 2019 at 4 pm at Christ Church Cathedral. 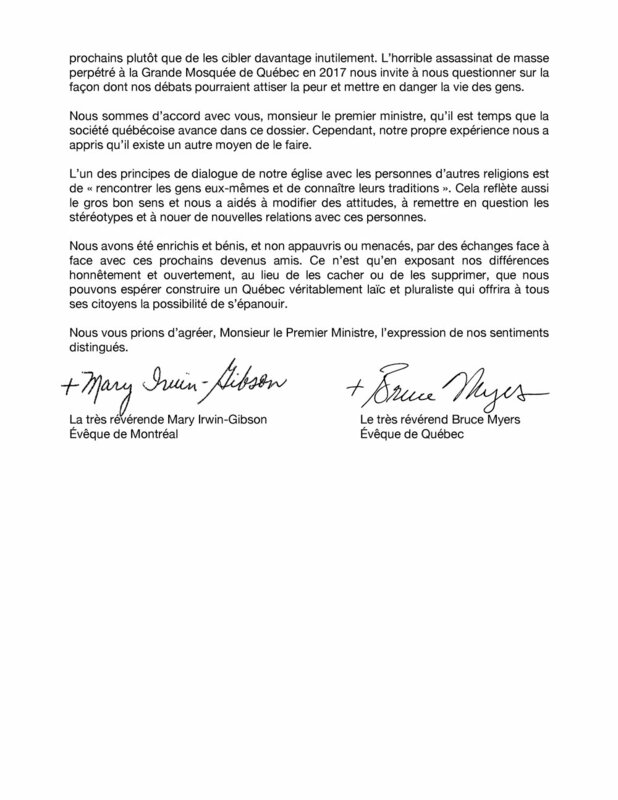 Bishop Mary Irwin Gibson and Archbishop Christian Lépine will be in attendance, as well as Bishop Bruce Myers and representatives from the Jewish and many other communities in Montreal. Before the service, there will be a special round table event for clergy and other leaders to help us think through the best ways in which we can both remember and engage into action for the future. I am hoping that there will be strong Anglican representation at this service, which will be followed by light refreshments, and would therefore be very grateful if you would be able to attend and encourage others. I attach the English and French language press releases together with posters you might like to display. Il y a quarante ans, mon prédécesseur, Dean Shepherd, commémorait la Shoah à Montréal pour la première fois. Cet événement a eu lieu le 22 avril 1979, a été répété à la Cathédrale l'année suivante, et a eu lieu dans différentes églises autour de Montréal depuis. Cette année, à l'occasion du 40e anniversaire de cette première commémoration, ce service – organisé par le Dialogue Judéo-Chrétien de Montréal - revient à la cathédrale Christ Church. Je vous écris donc pour vous inviter, vous et les membres de vos congrégations, à vous joindre à nous pour ce service qui aura lieu le 5 mai 2019 à 16 heures à la cathédrale Christ Church. 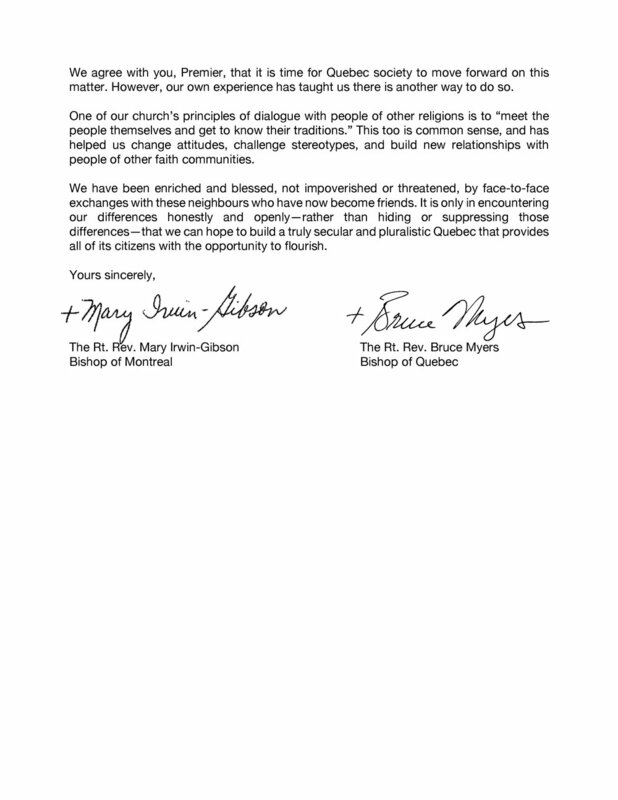 Mgr Mary Irwin Gibson et Mgr Christian Lépine seront présents, ainsi que Mgr Bruce Myers et des représentants de la communauté juive et de plusieurs autres communautés de Montréal. Avant le service, il y aura une table ronde spéciale pour le clergé et d'autres leaders afin de nous aider à réfléchir aux meilleures façons dont nous pouvons à la fois nous souvenir et nous engager dans l'action pour l'avenir. J'espère qu'il y aura une forte représentation anglicane à ce service, qui sera suivi de rafraîchissements cachère, et je vous serais donc très reconnaissant si vous pouviez y assister et encourager les autres. Je joins les communiqués de presse en anglais et en français ainsi que les affiches que vous aimeriez peut-être exposer. Grant Awarded from Mission Standing Committee! Congratulations to St George’s, Chateauguay for receiving a grant from the Standing Committee on Mission! The parish received $750 to fund their project The Spaghetti Garden. The garden, which will be planted in the spring, will contain tomatoes, onions pepper herbs and garlic which will be harvested and made into tomato sauce for a spaghetti dinner. Proceeds from the dinner will go to the local food bank. “To respond to human need by loving kindness”. Have a project for which you need funding? Visit the Mission Committee’s webpage to find out how to apply for a grant of up to $2,000! Maternal Health Symposium to Raise Funds for PWRDF and local Birthing Center! Your $20 ticket also includes refreshments and free parking. A Save the Date flyer is attached – you can buy tickets to the event or donate by opening the pdf and clicking on the orange button. A brochure giving more detailed information is also attached. Please note that no tax receipt will be given for the cost of the tickets; however, the full price of the ticket will go to the fund raising. A tax receipt will be given for any donation over $15. We hope that you will let your community know about this event and will encourage them to attend. In an effort to cut waste and cost, the Anglican Church of Canada’s Communications and Information Resources Department is requiring anyone(including clergy!) who wishes to continue receiving the Anglican Journal and their diocesan newspaper to confirm their address. You can do so either online, through the attached mail-in form, by email or phone. (see below for details).Failure to do so will mean that your subscription to the national and diocesan paper will be terminated at the end of June, 2019. Or you can give your information via email yes@national.anglican.ca or phone1-866-333-0959 or you can print out and mail the attached coupon. The national office is no longer sending out parish lists to update, BUT – If you have a parish list that you would like to send in to the national office before June please do so! They will accept this as well as individual opt-ins. For more information and clarification, please take a look at the attached coupon/notice that will appear in the March issue. Please do all that you can to support the Anglican Journal and the Anglican Montreal. Every subscriber will count! Congratulations and thank you to all of the participants, leaders and supporters of the Lenten Mission and Outreach Day (LMO) yesterday. We are thrilled to report that 45 people attended the event. Over Twenty youth and young adults took part in service projects. We are so hopeful about the impact that this event will have in our hearts and communities. The #LMO19 is a reminder of why the church matters. Thank you for being the church in the streets, in the seniors residence, in the garden and in the Cathedral.